Chicken Saltimbocca is a simple and classic Italian dish where chicken breast fillets with mozzarella cheese, sage leaves and wrapped in prosciutto are cooked and served with a sauce made from stock and dry white wine along with baby potatoes. 1. Chop the mozzarella into 4 equal slices. 2. Top each chicken fillet half with a slice of cheese, couple of sage leaves and wrap it in a slice of prosciutto. 3. Secure the sage leaves with the prosciutto with a toothpick. 4. Cook the baby potatoes in salted water for 2 to 3 minutes. 6. Heat 1 tblsp butter and 1 1/2 tsp oil in a pan. 7. Add the potatoes and some sage leaves. 8. Stir-fry for a minute or two. 9. Sprinkle some salt and transfer to a bowl. 10. Heat the remaining oil in the same pan. 11. Cook the chicken halves for 2 minutes each side or until cooked through. 13. Add the remaining butter, wine and stock to the pan. 14. Bring to a boil and reduce flame. 15. Simmer for 4 minutes or until it is reduced slightly. 16. Sprinkle some salt and pepper powder. 17. Stir gently and remove. 18. Serve the cooked chicken with the sauce and potatoes. 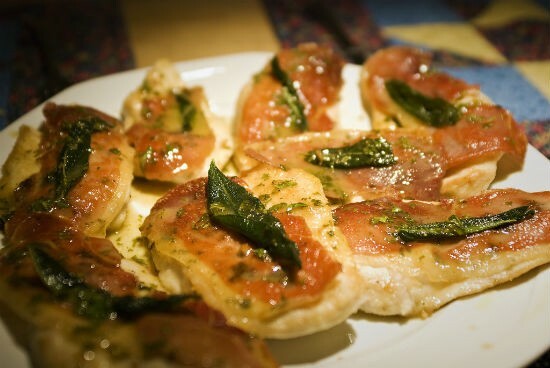 Feel free to comment or share your thoughts on this Chicken Saltimbocca Recipe from Awesome Cuisine.